American Awning & Window is fully licensed and insured to design, manufacture and install custom aluminum awnings, canvas or fabric awnings and storm doors or windows in the State of Massachusetts. American Awning has been serving customers in the Southeastern region for over 25 years, providing top-quality services to both residential and commercial clients. Since 1984, our expert technicians have been providing the sales and installation of these products to homeowners and business owners from Cape Cod to Boston, New Bedford to Fall River and just about everywhere in between. Visit American Awning in New Bedford, Massachusetts to see a full showroom featuring the top quality products and services we provide first hand. American Awning has earned a reputation for designing and manufacturing custom aluminum awnings that exceed the industry standard. As a result, in addition to working with residential and commercial clients, American Awning also provides aluminum awnings to wholesale awning providers. There are many reasons why home and business owners choose to add custom awnings to their properties. Whether you choose to install aluminum, canvas or fabric awnings at your home or office, awnings add an attractive appeal to just about any type or style of building. Call American Awning & Window today to find out more about all of the products, services, custom awnings and more that are available to residential and commercial customers in Southeastern Massachusetts. 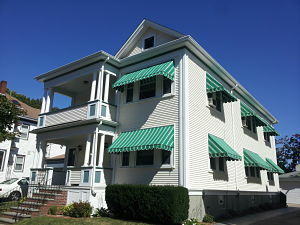 Use our handy online contact form or call for details about awnings in New Bedford at 508-995-6333.